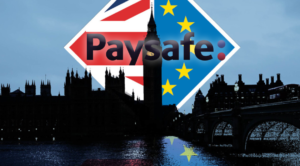 Paysafe Brexit is a short term for what is currently planned as a result of the United Kingdom (UK) to leave the European Union (EU). It is very likely that the Brexit is about to happen in the near future while the UK companies invest lots of energy and efforts to minimise the impacts for the customers and business partners. Paysafe gave us an exclusive short overview of facts about their Skrill Brexit and NETELLER Brexit plans to make sure that their customers and merchants will be able to continue using their services as before. Brexit – Changes for Skrill & NETELLER Customers? There will be NO changes for Skrill and NETELLER clients. Merchant contracts and conditions will remain the same. Skrill and NETELLER will technically split its business by region. Operationally there will be no changes. Skrill is a UK authorised and regulated electronic money institution which is operating in the European Economic Area (EEA). Paysafe is preparing their plans for the Brexit. 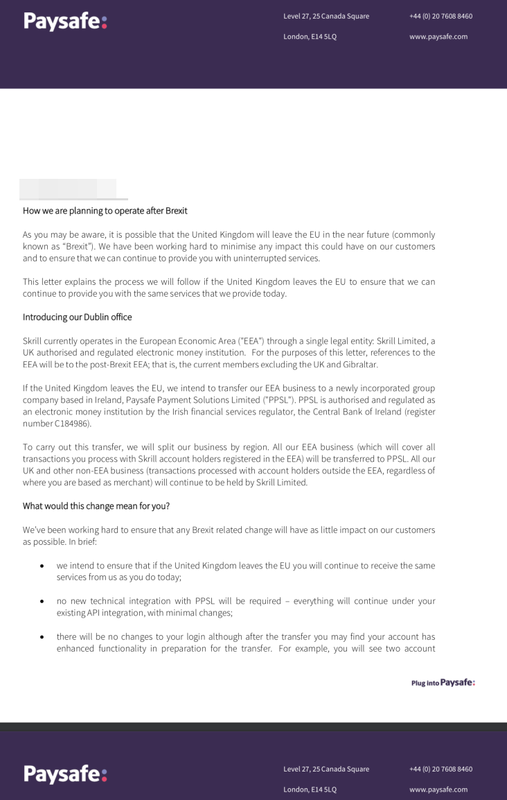 If Brexit takes place, the company will transfer its EEA business to a newly incorporated group company based in Ireland. “Paysafe Payment Solutions Limited” is authorized and regulated as an electronic money institution by the Irish financial services regulator, the Central Bank of Ireland. It is expected to be announced at their “Paysafe Insights” blog very soon once the Brexit will be confirmed. In order to make this transfer happen, Skrill is going to split its business by region. From now on, the new PPSL will take care of the EEA business. The UK and other non-EEA business will remain part of the Skrill Limited. Merchants will continue receiving the same services as today. No new technical integration with PPSL necessary. No changes to the merchant login. A new contract with the same terms as existing ones with PPSL for EEA business. Existing contracts will continue to remain on the same terms for the UK and non-EEA business. 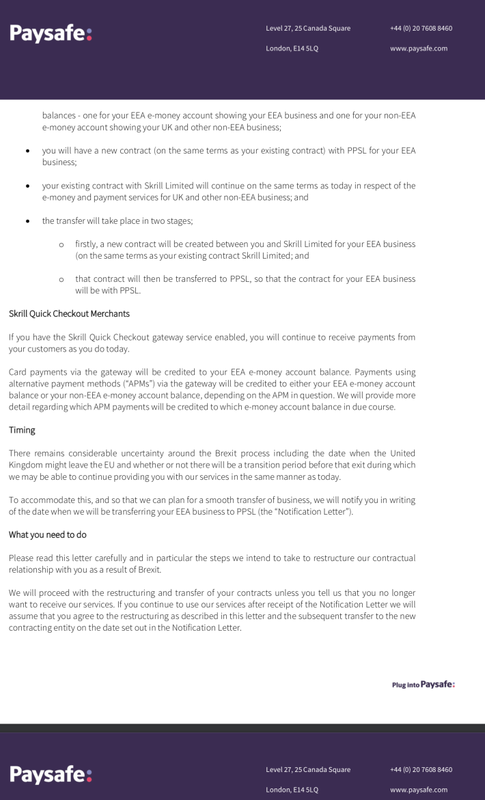 Paysafe will create a new contract between merchants and Skrill Limited for EEA business. Skrill will transfer the contract for EEA business to PPSL. It is still uncertain when the Brexit is actually going to take place and whether or not there is going to be a transition period before that. The Paysafe Group is going to let their merchants know when they will transfer their EEA business to PPSL through the “Notification Letter”. Users of the Skrill Checkout Merchants gateway service will still receive payments from their customers as before. Skrill will transfer card payments through the gateway to the EEA e-money accounts. Payments which have been made using alternative payment methods via the gateway will either credited to EEA e-money accounts or non-EEA e-money accounts, depending on the payment method. Skrill will provide detailed information about this process later on. 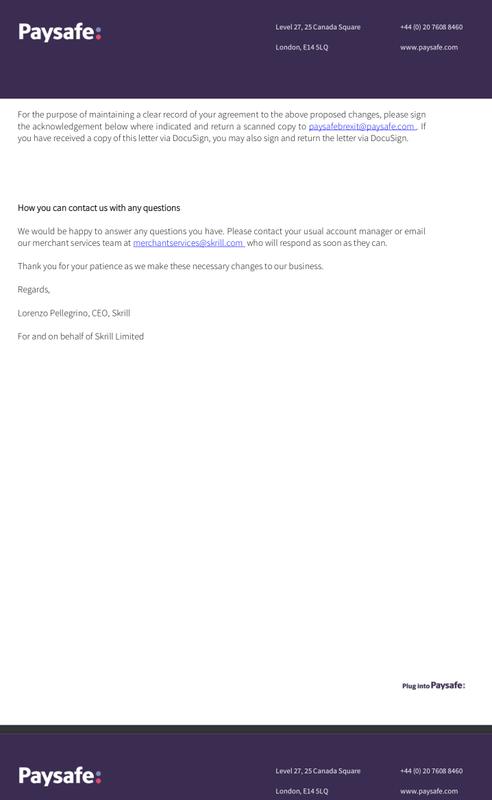 Merchants can continue using Skrill after receiving the above-mentioned Notification Letter, the company will assume that they agree to the restructuring of terms and the subsequent transfer to the new entity. Basically, they will be able to use Skrill as before. Only if they want to quit using Skrill, they need to inform Skrill so that they will no longer be able to transfer funds using Skrill. For any questions please do not hesitate to contact us .